This mod version was tested with SoaSE v1.05. Because the original fonts are sometimes hard to read, especially when you use higher resolutions, I replaced them with the "Segoe UI" font making the fonts in the game much easier to read and friendlier for the eyes. To make this mod work you have to have the "Segoe UI" font installed into your Windows font folder. The font will than be automatically installed. Unzip the content of this archive to the "Mods" folder of SoaSE. After that open up SoaSE and activate the Mod. P.S. Keep in mind that this mod ist still in beta stage. This is just because there are a few dialogue where the text is not fitting perfectly when using the new font. Thank you so much for this mod! 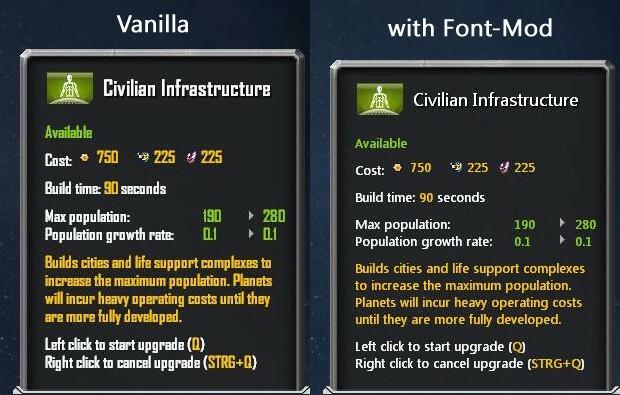 While I really like the "look and feel" of the in-game font, I find it very hard to read on my high-resolution monitor settings. Does this work on ICO? Of course it does. It just edits the default font for your client. This is great. I can actually read the text now. I did however, make a minor change before I used it. I changed all references of "Segoe UI" to "Arial" and reduced the height by in each place by 2. This means I don't have to install the office compatibility pack (I don't have or use office) and all the text fits the windows without having to resize any of them. well, i installed the mod with much excitement the fonts changed actually but whenever i left the options menu and opened a "new game" menu, everythings are messed up, the scenario names are all labeled "string not found" i have started a game and everything seems ok. but the error messages are annoying for sure. The download didn't seem to work for me. I downloaded it (came in as a 472K file) and then unzipped it. A folder popped up showing the files but I received an error when I tried to drag them to my desktop, suggesting that I didn't get the entire file. Great mod, thanks! Will you update it for Entrenchment or Sins > 1.1? excellent mod m8. Thanks for the effort. Its a shame really. The way the game gets updated, breaks the mods to the point that this section is almost dead. not one single thought was given to how mods were implemented against how the program is updated. It looks like no matter how trivial the update, it breaks most all the mods. A shame really as the mods were a selling point of the game. It's almost like the mods engine in the game is designed like trainers are. Bad QC, if any were ever tested at the company. Now its almost impossible to determine which version is needed to play wichever mods, or else the modders are perpetually updating to fix what the company updates and addons are breaking. It really could have been designed properly. quite the pity. Yes indeedie. I will take this mod. Game font is bloody awful. Thank you.